Unsurprisingly, the latest round of talks between Israel and Palestine has been no less difficult than previous ones, with US Secretary of State John Kerry warning shortly before the talks began last summer that their failure could “lead to a third intifada,” and Israel announcing the construction of thousands of additional settlements on Palestinian land and demanding that Palestine recognize the State of Israel’s “Jewish” character. With the talks appearing to stall in the first weeks of January as the Israeli defense minister criticized Kerry’s demeanor, both sides have been keen to stress that they are not discussing a final settlement, but only an agreement on principles on which to take future talks forward. 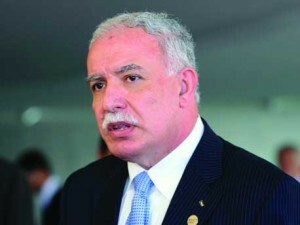 And so, in this exclusive interview, Palestinian Foreign Minister Riyad Al-Maliki tells Asharq Al-Awsat that what is being negotiated is only a “framework” for further negotiations—negotiations that, in his view, may not happen. Asharq Al-Awsat: Can you tell us what happened during the Paris meeting last Saturday between US Secretary of State John Kerry and the Arab monitoring committee? Riyad Al-Maliki: Kerry wants to put the Arab foreign ministers in the picture regarding the efforts he is making, giving them some form of assurance that he is doing everything in his power to produce an agreement that will be as acceptable as possible to both sides. But in any negotiation process, you cannot completely satisfy all parties and so both sides must accept making some concessions to reach a consensus. Both the Israeli and Palestinian leaderships have to accept this before an agreement can be reached. He [Kerry] asked the Arab ministers to understand what he was trying to do and back up his efforts, and to support the position of the Palestinian leadership in the event that it agreed on the framework agreement that will be presented to it in the near future. The Arab ministers had some questions for Kerry, and they informed him that they would study this framework agreement when it was issued, and they would listen to the opinion of the Palestinians. And if the Palestinians accepted they would accept, but if the Palestinians rejected the deal then so would they. Let me add that we [Palestine] are happy with the Arab position. In a previous meeting, I outlined the contention issues in this agreement, and I called on the Arab ministers to inform the US Secretary of State of the Arab position so that he understood that the Palestinians were not alone, but had the full and strong support of the Arabs. This is something that was strongly reiterated by Saudi Foreign Minister Prince Saud Al-Faisal. Q: Let us talk in detail about the Palestinian–Israeli negotiations. What has been achieved so far, after five months of negotiations and 10 months of Kerry’s shuttle diplomacy? Everybody knows what each side’s position is. But what is new is that at the latest round of negotiations the Israeli prime minister [Benjamin Netanyahu] added additional conditions that have complicated things, such as recognizing the Jewish nature of the state. This had never been raised before during Israel’s presence in the Jordan Valley. He also told the Likud Party’s Central Committee that he would never accept reference to the terms “Al-Quds” [Jerusalem] and “Al-Khalil” [Hebron], and more. We are today on the verge of entering the third stage of negotiations after the first phase, which brought together the Palestinians and Israelis, and the second phase, in which the US played a more active role as mediator, shuttling ideas and positions back and forth. As for the third stage—putting forward proposals and the framework agreement—we can only reach this after the issues have developed past a certain stage. Up to now, the US has been putting forward separate ideas that are now part of the framework agreement. Q: Washington does not want to comment on the details of the negotiations, but there have been a number of leaks, including one report in the media that Israel wants to keep control of 6.85 percent of the West Bank, offering 5.5 percent of territory elsewhere in exchange for this. Is this true? No percentages have been discussed. The leaks in the Israeli media cannot be trusted. To be clear, when we have talked about the principle of land exchange, this is tied to issues such as value and ideals. We said that we would only accept the lowest possible proportion of this [land exchange]. We agree to this in principle, but we have yet to study in detail how this would work. Neither have we suggested geographic locations for this. These issues will be left for the fourth stage of the negotiations. Therefore, these details are not correct. What we have explicitly and clearly heard from the Americans is that the territory of the West Bank will be returned to the Palestinians, as it was before, and the Palestinians will not receive less than this. We will have the entire territory of the West Bank: that is the principle. As for how it will be implemented, we have yet to study this. Q: You could be offered territory in the Negev, for example. Perhaps. But we would not accept this. We can reject [any offers]. We previously said no 12 times to the Americans, and we are prepared to continue with this when it comes to our principles. Q: What meaningful progress was achieved at the last round of negotiations? I cannot say that we have achieved any progress whatsoever. The issues of contention remain, and there are disagreements on all the issues that have been raised, and therefore I cannot say that we have had any achievements on anything. Let me also add that the divisive issues are far bigger than many people had thought and we will be unable to reach an agreement on them. Israel has asked us to recognize the Jewish identity of the state. I do not see any solution to this issue because it is something we will never accept. Q: What is the US position on this recent Israeli condition? Were they aware that Israel would put forward this requirement at this stage? I do not know. That could be the case. But until now, they are playing the role of mediator and conveying each party’s position to the other. They have not put forward their own view because we have not reached an agreement on this framework agreement that they want to put forward. Q: What about reports that the US has issued a document that has been criticized by some Israeli officials? This is not true. The American side is still playing the role of mediator until the two sides move closer on the contentious issues. This has been the role until now. Q: Do the Palestinians continue to hold to the principle that there can be no agreement on any part so long as there is no agreement on the whole? Yes, we are operating on the basis of this principle. Q: And do the Americans accept this negotiating tactic? Yes, they accept it a hundred percent. Q: But isn’t it true that Palestinian President Mahmoud Abbas has criticized the US role in the negotiations? I have not heard this. We believe that Kerry’s efforts are sincere and that his intentions are good, and that he has a genuine desire to reach an agreement that ends the state of ongoing conflict [between Palestine and Israel]. Since he first assumed his responsibilities [as US Secretary of State] he has focused his efforts on resolving this issue, and the best indication of this is that he has visited the region 10 times in 10 months. He has even been criticized at home for his focus on the Palestinian–Israeli conflict at the expense of other issues. So we must acknowledge this, and we are also well aware that he enjoys the trust of US President Barack Obama. Obama has shown confidence in Kerry and the diplomatic efforts he is making, and so we also have confidence in this. Q: When do you think Kerry will announce the framework agreement? This depends on whether his diplomatic efforts will meet with success or not. The deadline is set for the end of April. He could succeed and announce the agreement before this, or we could reach April 29 only for Kerry to announce that he has failed to reach an agreement, or to ask for more time. We cannot say at this point whether he will succeed or not. All of this is tied to Israel’s response and its willingness to reach an agreement. Q: If there is a framework agreement, what happens next? Will this lead to new direct negotiations to reach a final political settlement? The framework agreement will draw up the principles for the final agreement. I want to confirm that a framework agreement is not a temporary or partial agreement; it is a step that brings us much closer to a final agreement. Our intentions, along with those of the Americans, are for Kerry’s efforts to bring us to an agreement that brings a final end to the state of conflict. We want to reach a final agreement. Q: What about the other sides involved in the negotiations? Are they willing to reach an agreement? Kerry is seeking to reach this [final agreement]. So the framework agreement that is being discussed, should it happen [be accepted], aims to draw up this final agreement. The framework agreement will determine the final agreement. All that remains is to iron out the details, but it is also true that all the negotiations could blow up at any second because the details are so important and the devil is in the detail. We have not passed the point of no return. Q: So you are saying that even if there is a framework agreement, it is no guarantee that the negotiations will even reach the final stage? It will determine the final stage of the negotiations. Q: You said that there are a number of contentious issues. Which is the most intractable? This is the issue of recognizing the Jewish nature of the Israeli state. This is a sharply contentious issue. It would be dangerous to recognize this because this would mean our acceptance of the dissolution of our own history and ties and our historic right to Palestine. This is something that we will never accept under any circumstances. Acceptance of this would also raise fears about the fate of the 1.8 million Palestinians living in Israel. They are already second-class citizens, so how will they be affected by the Judaization of the state? This also raises questions about the [Palestinian] refugees and the right of return. So this is something that we absolutely cannot accept.